VILLAGE ATTITUDE – Keeping an attitude similar to old world shop owners is still the rock of good business in spite of changing technology. That attitude remains to be about relationships – consistently communicating with your village and merchants. Building your business traditions, telling your personal stories – these are the values customers love to believe in. You can no longer be just another website. EDGE OF TWILIGHT – Offering no conveniences of home and all the comforts of mountain high fortitude, there is a cabin in my past that I fondly remember and often dream about. It’s close to where a canyon gorge drops 4,000 feet below. Up there, shrouded in the clouds at Waimea Canyon, Koke’e State Park, Kauai, we crossed over the threshold and hiked into a sanctuary of silent isolation. This characteristic territory is where we would go to forget who we are and forget where the world is. There in the high country, in the wild and uncharted regions, surrounded by ancient wilderness, cool trade winds pushed castles of clouds up the rise of our mountain retreat. Equipped with wood stove, heavy blankets, and grilled rib eyes; the soft edge of twilight turned into deep night and became our sky window to the trillion stars. Opening its portal of time, all our tall tales, and blissful laughter lingered into the endless night hours. CABINS AND CLOUDS – This extraordinary retreat environment being a world away from the speed of iPhones and internet access always stimulates fresh new cerebral thought. It forces me to step away from my typical business and life activities for a new perspective, and just refresh the mind. The experience is like passing through a portal in time. The Hawaiian November dissolves like a Smoky Mountain autumn-chill in the cool highlands of Koke’e, being just about 30 degrees colder 4,000 feet from sea level. 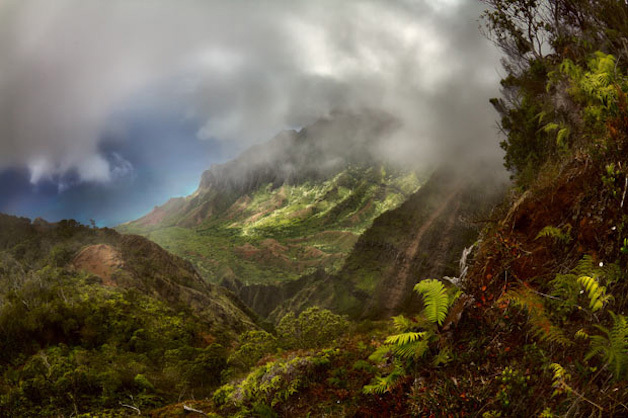 One of the world’s most inaccessible and enchanting regions, Koke’e is a place storied with myths and legions about ancient gods and the exploits of the ancient Hawaiian’s. It’s more than just wilderness hikes or a typical corporate retreat loaded with team building activities. This is wild isolation in a strange world of mountain mist sculpted by fire and water with unparalleled beauty.